What is the best glass surface upon which to print a photo? Well, first let’s list the various possible surfaces. The easiest is to print on a smooth surface [shown]. A variation is to print on the smooth side, but wind up with the photo on the back of the glass. In this case, it is necessary to set the film in the enlarger emulsion side up, or else the image will be reversed. Both of the glass surfaces need not be smooth and clear; one side can be sandblasted and the photo printed [as usual] on the clear, smooth side of the glass. Using frosted glass on the non-printed side will allow light through but not every background detail, which focusses attention on the photo. Another variation is to “cold work” the surface with various size grits, perhaps down to 400 or 600. In this case, I have found that the print can be made on either surface [cold-worked or clear]. Finally, another method to render the surface opaque is to rub with a fluoride mixture [caution! ], then print. This etching method gives a very mild, subtle opacity to the glass, and may be all you really want. 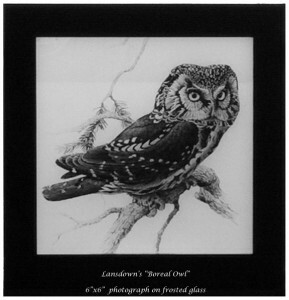 The “Boreal Owl” print above is a 6×6″ piece of frosted glass, printed on the glossy side. Experiment with all these possibilities, because each has merit with different photographs!